﻿﻿﻿ It feels like we are still a bit under the influence of the Capricorn moon, http://pixiedusthealing.blogspot.ca/2012/07/full-moon-in-capricorn-balancing-work.html at least in my part of the world. The air is charged with a thick heavy energy, there is lots of solar storm activity, and people seem rather intense, yet tired at the same time. Lots of people are complaining about dizzy spells and feeling off balance. It feels like a thunder storm is brewing that just might change the air- literally as well as figuratively. 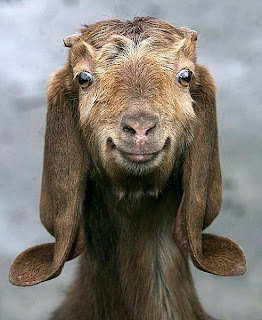 Capricorn is symbolized by the goat. 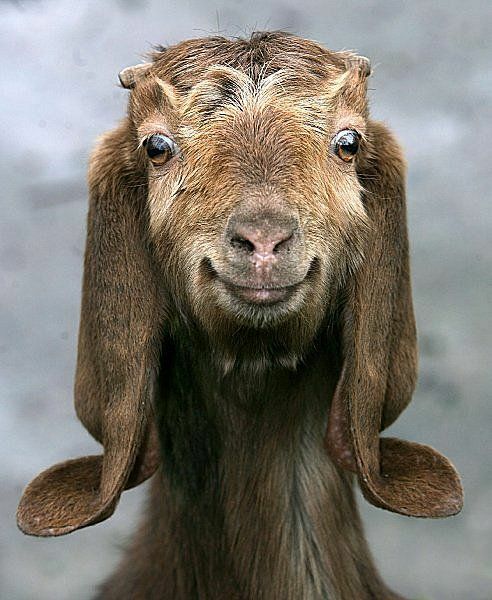 Someone sent me today's picture of a happy goat a long time ago, and today felt like a good day to share it. "call on goat energy when you feel out of balance emotionally, physically, psychologically, or spiritually and you want to regain your equilibrium". Goats are known for butting heads. They have the horns, the bone structure, and the skills to do this. Humans.. not so much. So, according to Farmer, the appearance of the goat could be a signal to stop butting your head against the wall. Stop trying to get through to someone that just doesn't "get it". Give up and give your head a rest! That alone, might help dispel the dizziness! Goats are great climbers. They maneuver impossible looking mountain slopes with ease. Goat energy is symbolic of that ability to move forward step by step, moving around and over the obstacles, never slipping as you climb upward. That step by step focus might be particularly helpful as we feel our way through the heavy energy, the solar flares, and the changing times. Capricorn energy can be pretty serious. That might be the intensity we're feeling these days. The lesson is to balance that hard working, reaching for the goal energy with some light hearted time spent in nature. Just look at the goat in today's picture and try to take life seriously!! There are a couple of Bach Flower essences that can be helpful in this somewhat dizzying times. Scleranthus might be very useful to find that integration required from the right and the left side of the brain that brings balance in the middle. It can be helpful for motion sickness and dizzy spells. It also helps when you are bouncing back and forth between thoughts, ideas, or tasks. Rock Water might be a Bach Flower to consider if you are feeling the heavy weight of a serious "stuff". http://pixiedusthealing.blogspot.ca/2011/06/bach-flowers-for-pitta-dosha.html Rock Water can help you find a bit of flexibility to relax and let go if you've become over-conscientious and still not satisfied with your achievements. Goats don't take the straight path up the mountain. They weave all around and seem flexible as to how they might get to where they want to go. They reach the goal because they focus on exactly where they are minute to minute. Hornbeam is another Bach Flower essence to consider if you're feeling "goat energy" around you. Capricorns are particularly good at taking on big projects and working with great determination towards the end point. But if that project you've agreed to take on is feeling so overwhelming you're not quite sure where to start, a few drops of Hornbeam might get you started People that can benefit from Hornbeam often suffer from overwork. So perhaps, again the message, is to relax, allow, and go smell the roses http://pixiedusthealing.blogspot.ca/2012/06/wild-rose-summer.html before taking on yet another project. I guess the phrase for the day, when the world feel so heavy your head is spinning ,is "Lighten up People"! !